Additional funding is provided by the Tomorrow Foundation and by the Stella and Charles Guttman Foundation, Inc.
Curriculum Units & Lesson Plans - We have hundreds of classroom-tested, readily-available lesson plans and full curriculum units developed for teachers, by teachers. We're powered by Google so you're a click a way from the subject, topic, and grade level you're looking for at our Google Search. How-To's - Find out how to do just about anything in your classroom and, if you need help, ask one of our Online Mentors. You'll get a response within 72 hours! Grants - We have TeachNet grant applications available now and information about more grant opportunities. 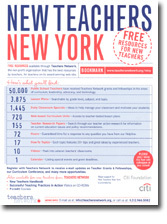 Teacher Research - Fellows in our Teachers Network Leadership Institute conduct and publish action research. Please feel free to cite our Research. Be sure to also check out our Online Courses, our Videos, and our Teacher Store to help you become the best teacher you can be.